October 25, 2018, VDM-Tekhnika LLC participated in the IV Forum “Composites without Borders” at the Skolkovo Innovation Center. October 3-6, 2018, VDM-Tekhnika LLC participated in the International Forum “Russian Energy Week — 2018”. General Director Vladimir Masolov spoke at the round table “Application of RES in Russia”. June 5-6, 2018 “VDM-Tekhnika” LLC took part in the IV International Congress REENCON-XXI "Renewable Energy of the 21st Century: Energy and Economic Efficiency". 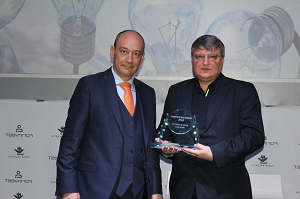 Our company presented the report "Dual-circuit energy storage for hybrid power stations with renewable energy sources". 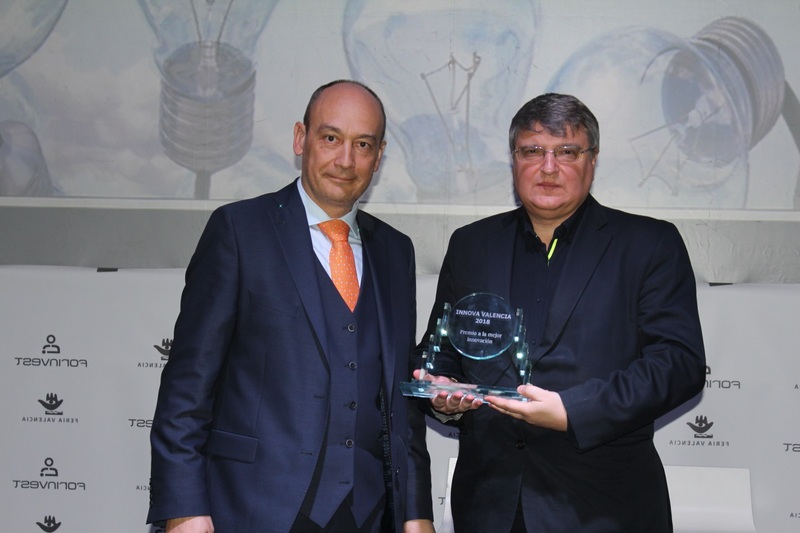 April 10-11, 2018 General Manager Vladimir Masolov took part in ARWE 2018 (Alternative Resources of World Energy Expo 2018) in Sochi. March 7-8, 2018 the World exhibition on inventions, research and new technologies «Innova Valencia 2018» was held in course of the FORINVEST 2018 (Valencia, Spain). 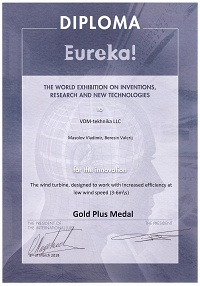 «VDM-tekhnika» LLC represented the project «The wind turbine, designed to work with increased efficiency at low wind speed (3-6 m/s) ». The results of the researches have been fixed by the international applications WO/2017/111645 (23.12.2015) and PCT/RU2016/000848 (13.12.2016) «The method of adjusting wind turbine power take-off» and now 16 international patents are being performed on their basis. 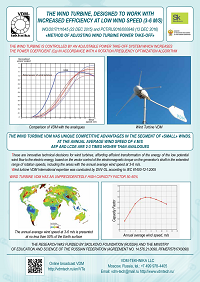 The results of the researches create premises of appearance of the new segment in the global wind energy market. 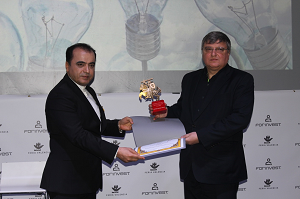 The project was highly appreciated by the International Jury. 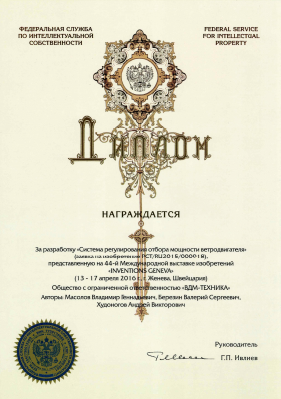 We were awarded with the Gold Plus Medal (grand prix) and with the Premio a la mejor innovacion (the main prize by the Jury), we also gained the diploma and the prize from the Iranian delegation, the diploma and the prize from the Moldova delegation and the diploma from the Russian Federal Service for Intellectual Property. December 6, 2017 General Manager Vladimir Masolov participated in the 10th National Conference of the Russian Association of the Wind Industry (RAWI). December 4, 2017 General Manager Vladimir Masolov took part in the session «Energy conversation of the Arctic: problems and possibilities of small generation» at the VII International Forum «Arctic: today and the future». 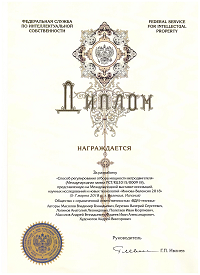 Since September 26, 2017, according to the Agreement with the Ministry of Education and Science of the Russian Federation, «VDM-tekhnika» LLC has been carrying out applied scientific research on the topic "Development of the combined energy store based on battery and supercapacitor modules for local power supply systems with the RES" in 2017-2019. 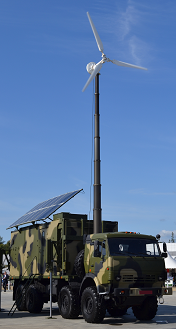 August 28, 2017 The wind turbine VDM 3 kW applies as a part of the mobile power supply unit. August 10, 2017 The article was published about the development of "VDM-tekhnika" LLC. August 1, 2017 A online broadcast of the Wind Turbine VDM 2kW operation was launched. 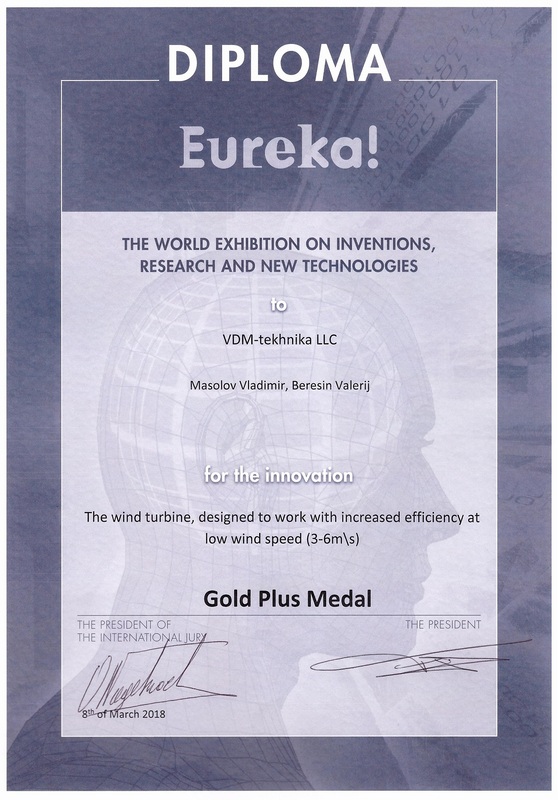 July 24, 2017 the Russian Association of Wind Industry noted at its site completion by VDM-TEKHNIKA LLC of the project to create wind turbines VDM with increased efficiency in the extended range of wind speeds. In January 2017, the Project co-financed by the Skolkovo Foundation was implemented. 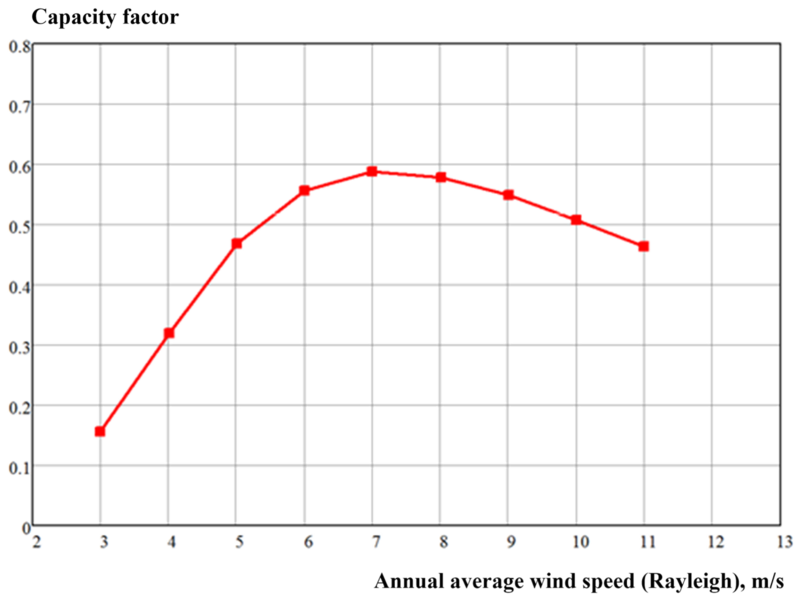 The designed wind turbine for high efficiency operating in the extended range of wind speeds, including the areas with the average annual wind speed (Vave) of 3-6 m/s, was created. 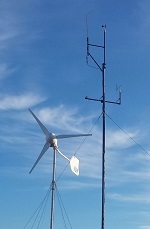 In course of the Project on the test site in St. Petersburg the wind monitoring was held (IEC 61400-2) and field test of wind turbine was conducted (IEC 61400-12-1) with the use of hardware and software complex including wind measuring complex. International Project expertise was conducted by DNV GL. 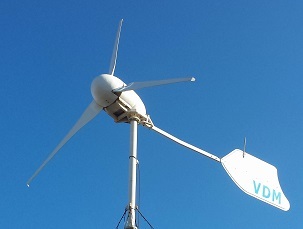 The small wind turbine prototype was tested, in the result the rated wind speed was 7 m/s, the value of installed power efficiency (capacity factor) was more than 0.50 for Vave 5-10 m/s. 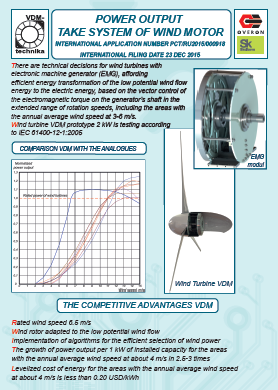 The rated power of wind turbine VDM in comparison with analogues. 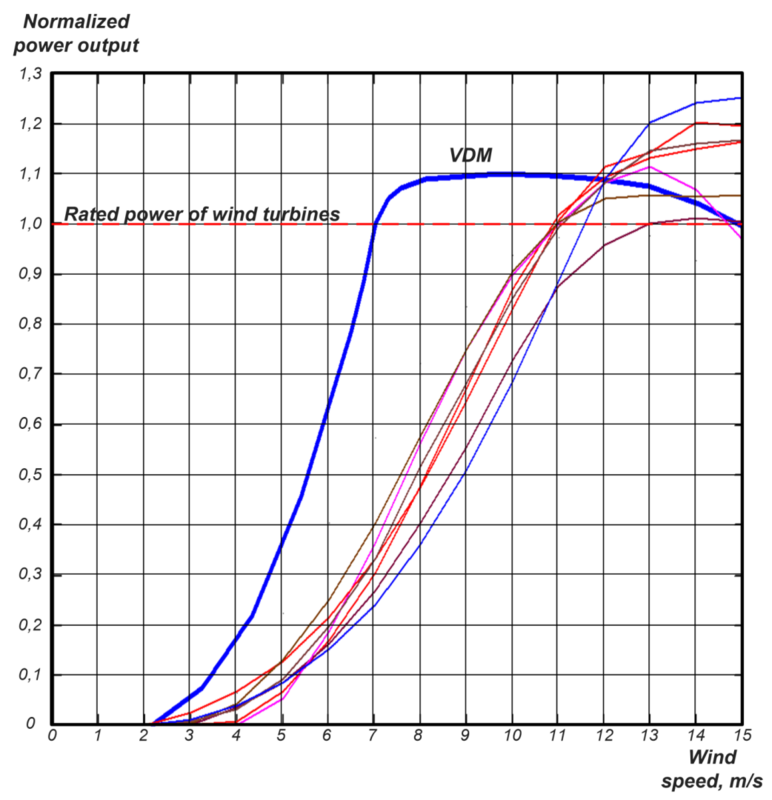 Dependence of capacity factor for wind turbine VDM. 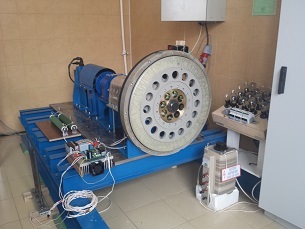 The international applications PCT/RU2015/000918 and PCT/RU2016/000868 "The method of regulating wind motor power take-off" were filed on the obtaining of invention patents. 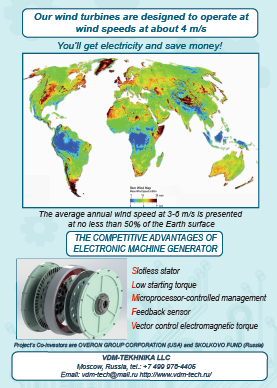 03.06.2016 - VDM-TEKHNIKA LLC has presented the Project “Electronic machine generator for wind power turbine” at the round table "Energy of the Future: Service or Commodity", held in the framework of “Startup Village”. 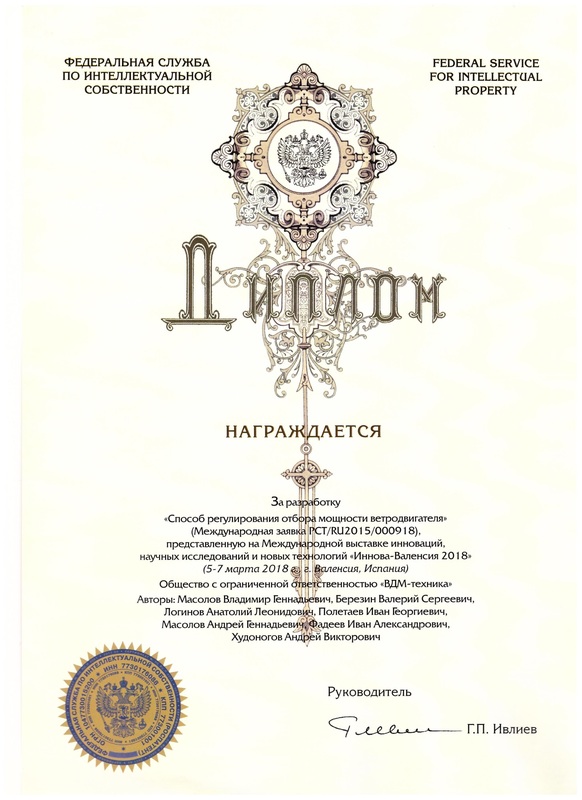 As a result of presentation VDM-TEKHNIKA LLC received an invitation from the PJSC "RAO Energy Systems of the East" to participate in the IV International Conference "Renewable Energy Development of the Russian Far East" (Yakutsk city, 09-11.06.2016). 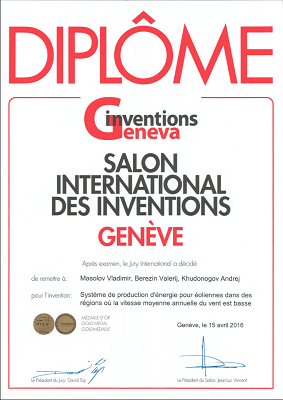 Our development "POWER OUTPUT TAKE SYSTEM OF WIND MOTOR" was awarded the Gold Medal on the 44-th International Exhibition of Inventions in Geneva (Switzerland), 13-17 April 2016.